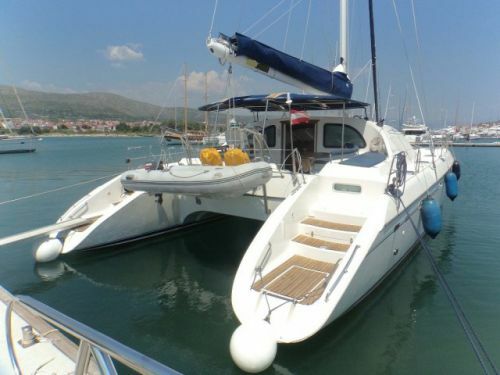 Looking to sail from Trogir? Search to find and book your ideal boat, or read everything you need to know: prevailing winds, where to sail, how to get there and more! Trogir has such a beautiful medieval old town centre that they designated the whole of this small island as a UNESCO world heritage site, and there's something magical about starting and ending a holiday here. If exploring the narrow cobbled streets and marvelling at the architecture doesn't do much for you, there's also forests and beaches to delve into! Truth be told, given the glorious sunshine, you'll enjoy almost everything you do. There's lots of different options for sailing from Trogir, and plenty to see or do on the way - from the majestic hill-top castle looking over the party town of Hvar, to the natual beauty of the Blue cave just off Vis, sampling cocktails in a secret bay off Paklinski Otoci, or trying the local food and honey liquers in Maslinica. You could also head down the coast to Split, or, if you have two weeks, the Kornati islands are well within reach. From Trogir, sailors are blessed in being able to travel in virtually any direction and to stumble across areas of insane beauty or cultural interest. From hilltop fortresses in the party capital of Hvar, to secluded bays with crystal clear waters and brightly coloured fish, everything your eyes see will put a smile on your face. If you have time, the famous Blue cave – where the cave is lit by an ethereal blue light – is well worth a visit, as is our favourite bay to anchor up in: Paklinski Otoci, on the south of Palmezana island, where you can drop the anchor near six restaurants exclusively for sailors, plus enjoy cocktails and a buzzing nightlife well into the night! A medieval hill-top castle perched above a renowned party-town, with fine-dining restaurants? What’s not to like?! Moor up in a cruisers paradise: a bay with six bars and restaurants literally in the middle of nowhere, and only for sailors to enjoy! Warning: It gets busy, and the music plays into the night… We love Bacchus bar for cocktails! A dark cave on the Eastern side of Bisevo island with spooky sparkling, luminescent water – you have to see it to believe it. Easiest to take it in turns and head into the cave by dinghy, but totally worth it! This itinerary takes in the best parts of the sailing area near Trogir. In total, it comes in at 112 nM for the week, and is a great outline for your own voyage. You can easily do more or less sailing than this itinerary, and there’s lots of anchorages and bays that you’ll sail past which might warrant a stop-off for lunch or a quick swim. The longest day on this itinerary is over 30 nM (if you visit the blue cave at Bisevo), but most days are 13 – 18 nM, which should mean about 4-5 hours of sailing a day, with ample time for stopping en-route, to explore the start or end point, or do the shopping. On average, you can expect to be making at least 4-5 knots in a charter yacht or catamaran. This is only a 6-day itinerary because it assumes that you’ll be so busy checking in, getting provisions and such that you won’t be able to do much more than take her out for a quick spin before returning back to Trogir for the night, and properly setting off on Sunday morning. You’ll also need to be back in Trogir on the Friday night, as you’ll usually need to leave the boat by 9am on Saturday, so you’ll need to make sure you factor that into your plans. Here we go. Check everything is stowed below deck, then get everyone out on deck and give them their orders. The most senior should be on the helm, and get the two youngest on roving fenders, just in case, as it’s day one. The first day is fairly straight forward as you’ll follow all the other yachts South-west away from Trogir, either beating into the prevailing wind or reasonably close-hauled. Once you’re out of the Splitski channel, you can point the bow to South-east, and the island on the nose of the boat in the distance is where you’ll be spending the night. Milna is a great port of call for the first night - it’s a charming little town, full of historic buildings, including a bell-tower which dates from when Milna was part of the Venetian empire (this marina used to be called ‘the bay of a thousand ships’ when they used to do ship-building here), and holds a trove of paintings by Venetian masters. From Milna, you’ll be heading pretty much due South to the next destination, which is just a short hop away. Once you get to the island of Hvar, you’ll need to check your charts to navigate through the intricate web of picturesque islands to the south side at Paklinski Otoci, which is pretty much behind the marina of Palmezana (but Paklinski Otoci is a better place to stay, so it is worth sailing around), plus there is a big day tomorrow, and every mile helps. If you have time on your side, there’s an unnamed bay on the near side of south of Hvar island which you can stop at as you sail by – unbelievably, it is not connected to any roads, and looks like a sleepy little bay, but there’s two bars there (which also serve food), and it’s an optimal place to test the anchor and have a bit to eat. 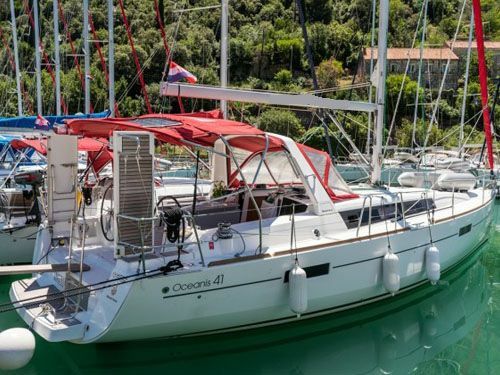 Paklinski Otoci is one of our favourite bays in the whole of the Mediterranean, and it really is a sailors paradise. Pick up a mooring buoy for the night (get there early in peak season) and the whole bay is surrounded by bars and restaurants service everything from local dishes with local beer to lobster and champagne cocktails. There’s a special atmosphere amongst all the sailors, and this is one of the few experiences you can only have if you have your own yacht – enjoy it! This is the biggest sailing day, but there are a number of options which you can take if the weather isn’t working for you, or if the crew protest to the mileage. If you’re sailing at about 5 knots, then the whole day should only be about 7 hours at sea, though, so with an early-ish start, you can easily be in the marina by mid-afternoon if need be, or you can anchor up in one of the bays in the area (like in Rukovac bay, on the South side of Vis) if you have provisions and water on board. From Paklinski Otoci, you’re reaching across the wind to bear South-west towards the isle of Vis. If you made a late start, you can go to Vis directly (it’s only about 10 nM). More intrepid adventurers will stick with the itinerary, as we’re headed to the ethereal blue cave of Bisevo, where a trick of the light makes the water in a cave (which you can swim in) a crazy neon blue colour. It’s a magical place to go, and thoroughly recommended. If you decide to go to Bisevo, the cave is probably easiest seen in two groups, with someone remaining on board your yacht at all times, so that you can just mill around the area instead of having to anchor up or find somewhere to moor. Take the dinghy to the entrance to the cave (which is on the East side of the island, and should be obvious by the number of other boats in the area), pay a small entry fee (it used to be free until about 3 years ago), and enjoy. Then head back and switch over. Don’t forget to take some photos. From Bisevo, head North-east to follow the South side of Vis right the way back around to Vis (or stopping at Rukovac if the wind allows). Vis itself has a long and bloody history, having been inhabited since 4BC by the ancient Greeks (and there are still ruins from this time), followed by the Romans, Venetians, Ottomans, the Austrians, the French, and even the British (who have a war cemetery here). The island is also notable for being the inhabited island which is furthest from mainland Croatia, and for it’s own species of palm trees (which are rare in this part of the world). From Vis, the next destination, Hvar is only a 13nM sail running with the prevailing wind in a north-westerly direction. If you were a massive fan of Paklinski Otoci, you could always head there in the evening, but we’d recommend exploring Hvar town for at least a few hours. If there’s no space in Hvar, you can moor up in Palmezana marina across the channel and grab a water taxi, though they are a little more expensive that you would like. When you were talking to friends about coming to Croatia, Hvar might well have been one of the towns that they will have heard of – that’s because it had something of a reputation for being a hedonistic resort a few years back, but don’t worry, things have calmed down a bit since then. Hvar is now known as much for its lively nightlife as it is for being something of a foodie capital, with fine dining restaurants a plenty – some with just four or eight seats who promise a gastronomic experience. The high point of trip to Hvar – both metaphorically and literally – is the view from Hvar castle. It’s situated a fair trek up at the top of the hill, but is well worth getting sweated up for. From here, you can find a wonderful panorama of the clear blue sea, the surrounding islands, all complemented by other holidaymakers’ yachts and catamarans. From the developed town of Hvar, the next stop is the village of Maslinica, which is in a North-north-west direction across the open water, which should be a good chance to get the wind in your sails and challenge each other to see who can sail on a bearing (and who can’t). Maslinica is the only port on the western side of the isle of Solta, nestled amongst pine forests and sandy beaches. Originally founded as a holiday home for a rich family, the island kept getting attacked by pirates so the owners built both a church and a castle here, to help protect them one way or another. Nowadays, Maslinica is a tourist town, and has won awards for being the best tourist destination in the Mediterranean with less than 1,000 inhabitants. It is most famous for its honey, schnapps, and for making the tastiest wine in Croatia. And so to the final leg of the voyage. Sad face. From Maslinica, you can take your time and bimble around the islands trying to find a nice beach or place to swim, knowing that you’re only a couple of hours or so from Trogir, which you’ll find in a North-easterly direction. There is only one place to get fuel in Trogir, and it gets mad busy on a Friday afternoon, so either head there early or be prepared to wait in line for an hour or so whilst you watch the organised chaos and jostle for position before filling up and heading for home. 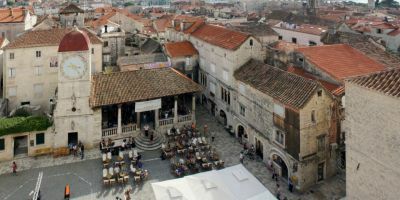 If you haven’t had time to explore Trogir properly, then now is also a good time to do it – it has a great old town with atmospheric narrow streets and a great range of waterfront bars and restaurants. There’s also a nightclub, if you want to celebrate getting the ship back safely with some heavy beats. Someone will be along to inspect the boat before you check-out, and then you’ll be stepping off it for one last time, hopefully with a heart full of the beautiful Croatian islands, new or renewed friendships, a smile on your face, and with a sense of tranquility that can only come from sun, sea and sailing for a week. Croatia is not so far from the Alps and the Dolomites, and winters here can be cold. Summer, on the other hand, offers pleasantly hot temperatures for sailing, with one benefit over Greece being that it’s unlikely to reach temperatures that are too stifling, or which require you to sit in the shade with an ice cream on your head all day long. In parallel to the sunshine, the sailing season in Trogir kicks off in May, when the sun comes out and temperatures raise, and runs until late September. There are large parts of the year when the sea near Trogir is warmer than the air temperature, including in July, when, at 25 degrees, the sea is almost as warm as a bath. Even during winter, the sea seldom falls below 15 degrees, so Trogir would be a good place to head out for a Boxing day swim. 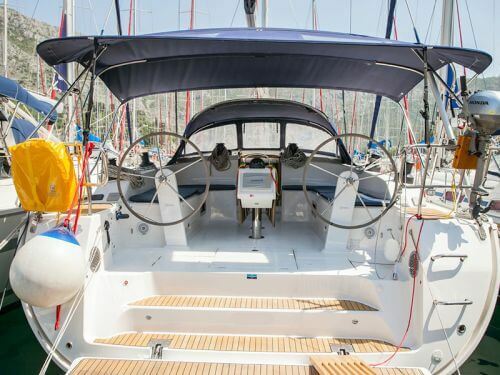 In addition to the sailing season and the sea temperatures, the sun also drives the prevailing weather conditions during the summer months. By warming the land, air is pulled off the sea during the day, so the prevailing winds are towards the land, and the hotter the sun is, the stronger the wind, generally. During summer, winds are traditionally between Force 3 and Force 6, and are oddly reliable - in that you can expect winds from 9am to mid-day, then there’s a short break (where local sailors say the winds go to have their lunch), before resurging in earnest from about 2-6pm. In the evening, light breezes may go back out to sea (when the sea is warmer than the land), but often the air is oddly still at night. 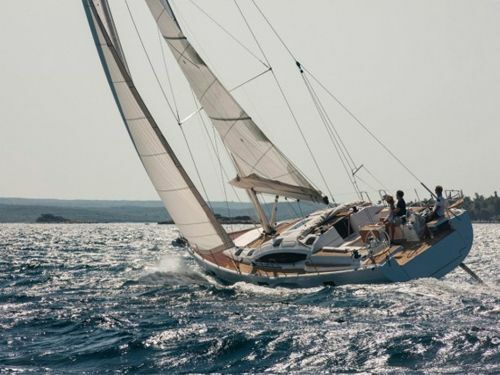 Sailing out of season is a bit less predictable, as there’s no such thing as a prevailing wind – they can come down from the mountains to the North, or arrive with tropical storms from the South. Rest assured that most weather systems pass within a few days. What is the Current Weather in Trogir? As well as being an excellent starting point for your travels – with many picturesque and interesting islands within a few short hours of sailing – Trogir is itself a holiday destination. The area is steeped in history - there are valid claims that the town is the best preserved Roman-gothic town in the Mediterranean, and the whole of the magnificent old town, with its narrow medieval pedestrianised streets lined with shops selling trinkets and ice-creams, was designated a UNESCO world heritage site in 1997, and is well worth an hour or so of wandering – particularly during the summer, when the temperatures force you into strolling pace. Further down the coast, there are superb beaches - which are popular with locals and tourists alike – and on a clear day, it’s possible to see mountains on the horizon. Those interested in sun bathing or beach sports should head to Komorac or ‘Mosquito’ beach, where a forest-backed beach would make you feel like you are out in the wilderness, were it not for the scores of other holiday makers. It is, nonetheless, an outstanding place to relax. Being a UNESCO heritage site, Trogir is also home to a thriving cultural scene, including its own festival. Trogir Summer Festival runs from mid-June to September and features local and international artists and entertainers in intimate and intriguing performance spaces right across the city, offering classical and folk music, and everything in-between. If you’re into Techno, you’ll be thrilled to hear that the Moondance Festival in Croatia is hosted in Trogir each year, when they turn one of the fortresses into a rave for three long days. It usually takes place in mid-August and features a world class line-up. Kristian Pizza – They take their food seriously here – all their pasta is freshly homemade (and delicious) and to top that, they also serve the best pizza in Trogir (Bl.A.Kazhotica 6a, Trogir 21220). Restaurant Vanjaka – Located in an atmospheric courtyard, this is the place to go if you’re after a taste of the local cuisine, like their traditional Dalmatian fish soup, or – bear with us on this – their excellent Octopus with Polenta. No, seriously. Large groups can pre-book using a contact form on their website. ( Radovanov Trg 9, Trogir 21220). Big Mama – Not necessarily one for the foodies, but this place will serve you a decent burger, panini or Cevapi at a great price, and it’s open till 2am (Trznica 23, Trogir 21220). Monaco – the only nightclub worth visiting in Trogir. 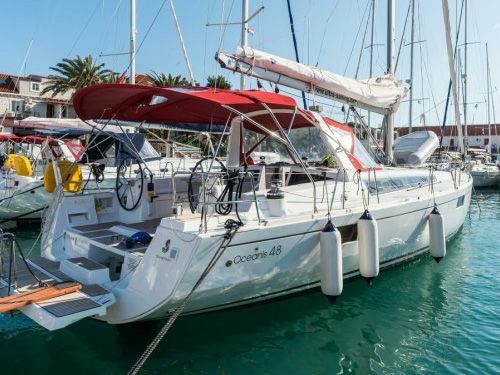 It plays a mix of music, including one night a week with a live band during the summer, and is a great place to let off steam on dry land (Obala kralja Zvonimira 7, 21220, Trogir). Hotel Trogir *** – c. £80/night for a double room - a fantastic hotel set inside a historic building right in the heart of the old town, and a very short stroll from the places to be. Domus Maritima *** - c. £90/night for a double room – situated across the channel from the old town, this sleek hotel offers stunning views of both the old town and the marina – so it’s the perfect place to start the holiday. Excellent food and free wifi. 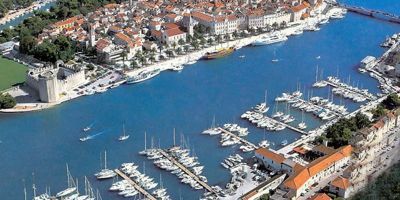 Trogir has been a major port town for centuries – even the Romans bought ships in and out of this bay – so it is not surprising that there are numerous marinas in the area. 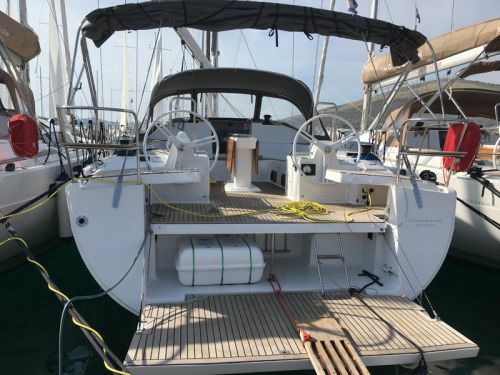 There are three which are principally used for holiday charters, which means that on Sunday morning and on Friday evening there can be a lot of traffic in the water, as the boats come and go. There are 3 different Marinas we operate out of in Trogir. The ACI Marina (175 berths) across the water from the UNESCO world heritage old town is the better established – and is the only one offering refuelling facilities – further along the coast there is the SCT marina (400 berths), and a little further still out from the town, the Baotic marina (400 berths) is more modern and includes a swimming pool and very elegant bar/restaurant amongst its facilities. 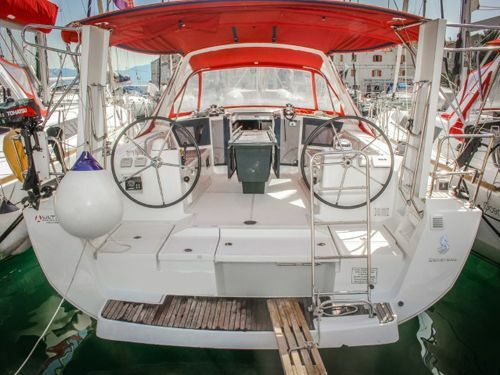 All offer wifi and the usual in-marina facilities, and are within easy walking distance to historic old town. SCT Marina is located next door to the ACI Marina, and is very convenient for walking into Trogir Old Town. Marina Baotic is 2 km away from the heart of Trogir. Trogir is just a matter of minutes from the Split International Airport, so getting a taxi is convenient and not too expensive - we can arrange a direct transfer so that a taxi will be waiting for you at the airport and can take you straight to the marina to start the holiday in style. 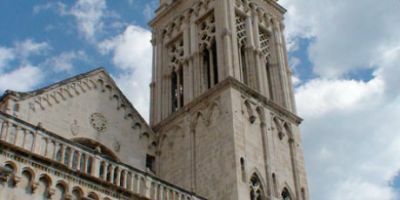 If you’re hoping to travel by public transport, then it is very much possible - you can get the regular airport bus to Trogir centre (the number 37 bus), and the three marinas are a short walk or taxi ride from the centre. 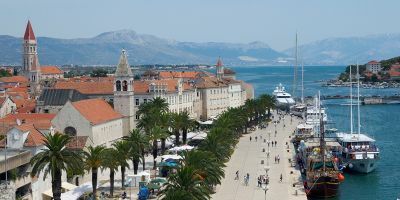 Trogir is also easily accessible by public transport from Split City Centre.